Nova Scotia’s tradition of craft brewing dates back to 1820 when Alexander Keith opened one of the first breweries in British North America. Although Alexander Keith’s is now part of a much larger brewing conglomerate, the beautiful historic brewery building is well worth a visit and a tour and you’ll find their beer on every pub and restaurant drinks menu in the province. The spirit of the original Alexander Keith lives on in the current generation of Nova Scotia craft brewers whose breweries and brewpubs are springing up across the province. Craft beer lovers visiting Nova Scotia this summer may want to plan their trip along one of three craft ale trails that will take them through some of the most scenic areas of the province and provide interesting stops for all the family. With its four craft breweries and two brewpubs, Halifax is the starting point for any craft ale enthusiast. Kevin Keefe, the granddaddy of craft brewing in Nova Scotia, runs Granite Brewery, which has a sister brewing company in Toronto run by Keefe’s brother. Granite is known for its unique beers, including its Yorkshire-style Peculiar, which is listed in Michael Jackson’sGreat Beer Guide. 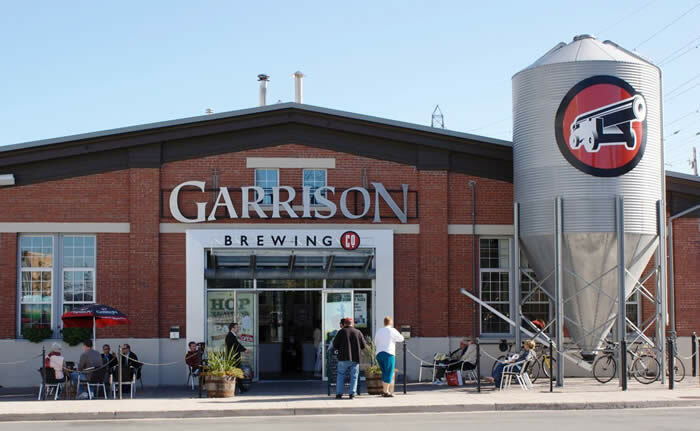 The biggest of the Halifax craft breweries are Garrison and Propeller, both of which tripled their production spaces this year to keep up with the market demand for their products. North Brewing is an eco-friendly nanobrewery that opened its doors in 2013. North specializes in Belgian-style beers and has the lofty goal of running a zero-emissions operation. There are two brewpubs in Halifax RockBottom Brewpub, an upscale night spot and restaurant on Spring Garden Road. Further up Spring Garden, the Rogues Roost across from Dalhousie University takes the youth vote as the best brewpub in the city. Although not a brewpub, The Henry House provides an outlet for Granite Brewery’s ales. To sample a range of what’s available,Maxwell’s Plum English Pub on Grafton Street has over 40 craft beers on tap from eight craft breweries in Eastern Canada. Stillwell Beer Pub on Barrington Street has also dedicated itself to the craft beer market. Four Brewing Companies now serve Nova Scotia’s Annapolis Valley, an hour from Halifax. .Schoolhouse Brewery opened this April in Falmouth in the original community school built in 1860 and is operated by Cameron Hartley and his wife, ironically school teachers. Wayne Shankel at Paddy’s brewery supplies Paddy’s Pubs in both Kentville and Wolfville with Celtic and Acadian styles of ales. Ten minutes away in Port Williams, veteran brewmaster Randy Lawrence runs Sea Level Brewing. 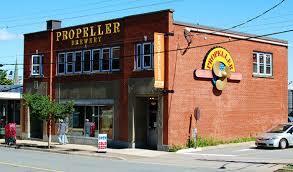 The microbrewery is co-located with The Port gastropub on the banks of the Cornwallis River. Patrons can enjoy Randy’s ales while watching the Fundy tidal bore fill up the riverbed twice a day.Randy is known for his 5k brewmaster dinners at the Port Pub, where all the food has been sourced from a five-kilometre radius and is served with beer sauces as well as appropriate beer pairings. Half an hour along the Evangeline Trail from Wolfville is Bad Apple Brewhouse in Somerset newly opened this March by Jeff Saunders who has been an amateur brewer for years and was ready to add some creativity to the local craft beer market. The Eastern Shore, the Cabot Trail and the Sunrise Trail offer spectacular scenery, delightful rural communities and a summer full of events. The craft beer enthusiast will also be delighted with craft ale discoveries along the way. In Antigonish, The Townhouse brewpub developed a loyal following—50 local shareholders paid $1,000 each to be part of this new enterprise, which opened in 2012 under the proprietorship of Terry Piercey and Rose Murphy. In Guysborough, Authentic Seacoast Brewing Company makes beer for the Rare Bird Pub and others. It is well known for its Full Steam Stout, which includes locally roasted organic fair trade coffee. In Nyanza, in Cape Breton on the Cabot Trail, Big Spruce has just opened the province’s first organic farmhouse brewery. It currently sells two ales: Kitchen Party Pale Ale and Cereal Killer Oatmeal Stout. Two new craft breweries have recently opened along the South Shore of Nova Scotia. Mark and Melanie Baillie run the nanobrewery in the village of Cherry Hill near Liverpool, making beer in their 150-year-old barn. In Shelburne, Emily Tipton and Henry Pedro, two engineers who shared a love of sailing and craft beer, opened Boxing Rock a new 17 HL brewery this summer. The name is taken from a rock in Shelburne Harbour where, according to legend, captains of sailing boats would drop off their quarrelling crew members to sort out their differences before the tide came in and drowned them. The Nova Scotia south shore is known for its sailing harbours, historic towns, beautiful beaches and great seafood. If you make it all the way to Yarmouth at the southernmost tip, reward yourself with a visit to Rudder’s Brewpub, with its spectacular ocean view, seafood cuisine, incredible desserts and selection of craft ale. Take a quick peak at Rudder’s Virtual Tour. Beer critics agree the brown ale is a stand out. A map of all the breweries and brew pubs of Nova Scotia is provided on the Uncle Leo’s brewery website. The map is slightly outdated as Hart & Thistle Brewpub in Halifax has closed and Bridge Brewing has been renamed North Brewing and Tatamagouche Brewing is not yet added. If you want to get the family onside for this trip, talk about the whale watching, shopping, rafting the Fundy Tides, swimming in the warm waters of the Northumberland Strait, Music Festivals for every taste, highland games,Tall Ships, Fortress Louisburg and Citadel Hill, canoeing the Shubenacadie Canal, wonderful lobster suppers, wineries and beautiful scenery. Tons of reasons to visit in the NS Tourist Guide and, oh yes, there’s beer. An earlier version of this blog appeared in on the Travel and Escape website which will soon be closing down its magazine site. Did you know that Hans Christian Jost after selling the winery now started a Micro-Brewery in Tatamagush ? I am getting ready to plant more acres of vine in N.S. This year again Petra is now tending to our own 7.5 acre vineyard in Little Shemogue. Next time you are back Downeast with Collin come and visit us please. We hope to go back down east this fall Klaus, it would be great to stop by. Read the article again Hans Christian’s Tatamagouche Brewing Co is mentioned.